On October 27, on the 18th Sunday after Pentecost St. George Parish family had a nice celebration. This time it combined several festive occasions. At the end of the Liturgy Fr. Igor reminded parishioners that on October 27 the Church commemorates Venerable mother Paraskeva, a Saint very much honored in the Balkan countries, as well as in Moldova and Western Ukraine. One of our parishioners and our altar server, Elisej Flora today celebrates his home, or family Patronal feast. It is a Serbian tradition to celebrate feast of a family Patron Saint (called “Slava”). Ven. Parakeva is Elisej’s family Patron Saint. On that occasion Fr. Igor congratulated Elisej Flora and his wife Anastasia and wished them God’s blessings, intercession of Ven. Paraskeva and many happy years. The choir sung traditional Polychronion (“Mnogaya leta”). Fr. Igor also congratulated our guest Paraskeva who celebrated her name day, and proclaimed the singing of Polychronion for her. Following the Liturgy the Rector headed the rite of “Slava” for Elisej and Anastasia Flora. He blessed and symbolically cut the offered bread (“kolach”) pouring wine on it. 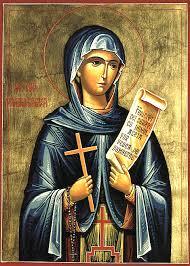 Hymns in honor of St. Paraskeva were sung. Fr. Igor congratulated the Flora family again. After all our services Rector and parishioners joined at the table for a celebration of today’s festivities. We enjoyed a warm company and delicious meals, as well as congratulated the people who celebrated their family and personal feast in honor of St. Paraskeva. Holy Mother Paraskeva, pray for us! After the Liturgy we had our coffee hour and enjoyed delicious refreshments and a good company. “Our time on earth is limited. Every moment is unique and unrepeatable. Tomorrow is not ours; today is. Now is the time to do the works of mercy. Now is the time to say a prayer. Now is the time to pronounce the words of forgiveness. Now is the time to repent if we have sinned. Now – before our time runs out. Now is the most glorious period of life. God’s time is always now. “Now is the accepted time…””. After the Liturgy dismissal Fr. Igor reminded parishioners in English and in Russian language that on this day the Church commemorates two holy men who were the first bishops of the two local Churches: St. Gregory the Enlightener of Armenia and St. Michael, the first Metropolitan of Kiev. Both became the first heads of the local Christian Churches, Armenian and Russian. The history showed how things can change. The Armenian Church which once was the Church of the first Christian nation in the world history, separated from the universal Orthodoxy. But the Russian Church preserved Holy Orthodox faith. This also proves St. Paul to be right when he says, “Behold, now is the accepted time; behold, now is the day of salvation” (2 Cor. 6, 2). We have to do the right thing at each moment in our life, in our history. We have to keep fidelity to the Holy Orthodox Church like those two Saints whom we honor today. On October 6th, on the 15th Sunday after Pentecost, we had our services at St. George Church. Our Rector, Archpriest Igor Tarasov celebrated the Divine Liturgy. At the end of the Liturgy Fr. Igor greeted our parishioner and Parish Treasurer Vera Koretz on her past Name day (September 30th) and wished her God’s blessings and intercession of her heavenly patron, Holy Martyr Vera (Faith). The choir sung “Mnogaya leta”. After that greeting our Warden Olga Roussanow congratulated the Rector on his past Name day, commemoration of St. Igor of Chernogov (October 2nd), wishing Fr. Igor God’s help in his service to the Holy Church and St. George Parish, a spiritual joy and success. The choir sung “Mnogaya leta” to our Rector. Following the services all joined at our delicious trapeza and could again congratulate Fr. Igor and Vera.